The Slime Blaster, unique slime fun and games from Simba. 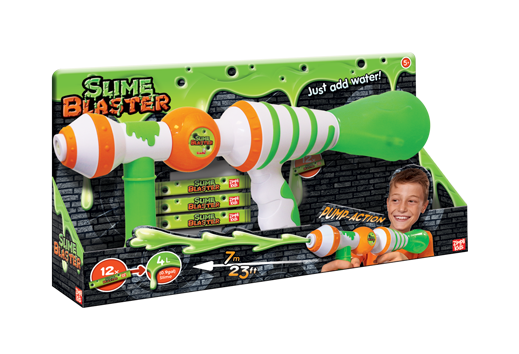 Instead of just spraying water, the blaster turns water fights into a gooey, oozy adventure where your opponent will be blasted with slime. The easy-to-hold blaster features a cool design and has a matching green and bright orange look. It is also easy to use: screw open the rear of the Slime Blaster, fill the tank with green powder, add 400ml of water and wait for approx. 2 minutes. Shake well and then it is slime blasting time. The 42cm long pump action gun can fire slime up to 7 metres. The 12 supplied refill packs ensure numerous slime battles. However, if you do run out of slime, packets of slime powder can be purchased separately or the Slime Blaster can be used with just water.